Aortic valve pathology is very common in today's cardiac surgical practice. In many centers, the procedure is still performed through a classical mid-chest incision. This provides a good surgical outcome. However, this large incision is unaesthetic, provides major discomfort (muscle and bone pain) and requires a prolonged rehabilitation postoperatively. To alleviate some of these side-effects, we have been operating the aortic valve via a very small incision, the so-called minimally invasive approach. The incision is about a fifth of the classical approach (figure 1). Needless to say that this provides a much more esthetic scar, markedly reduced pain and a much faster rehabilitation postoperatively albeit respecting the superb operative results of the classical procedure. 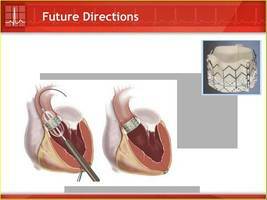 The technique is so successful that it has become our exclusive approach in aortic valve surgery since several years. However, this approach still uses the heart-lung machine in order to arrest the heart during surgery. This machine also has its potential inconveniences as has the arrest of the heart. In order to avoid these side effects, we have been working on a new percutaneous way to treat calcified aortic valves. Using a minimally invasive approach, without the use of the heart-lung machine and without arresting the heart, the diseased valve is dilated with a balloon and a new valve is inserted (figure 2). This procedure enables us to treat high-risk patients who would otherwise be declined for therapy. The procedure is extremely promising and a major step forward in the treatment of aortic valve disease.